Don’t be a faddy-duddy when it comes to telling people to save the date for your wedding day….think outside the square and do it with a bit of pizazz like this couple did! Not only was it a memorable way to announce the wedding date, it also presents the opportunity to set the scene a little….not that I think they were going to get married in front of a dumpster! 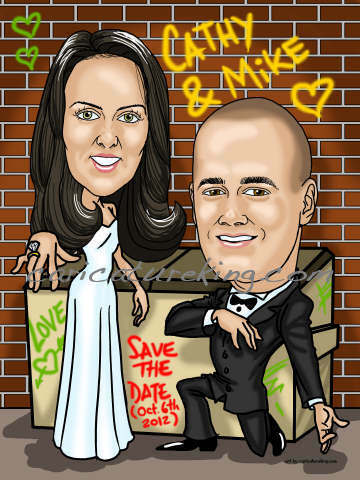 We can help create a wonderful artwork for your wedding save the date card (and invitations, and even a caricature sign-in board). Simply contact us to discuss your needs.